Here is an example of a before and after of one of our patients. Due to several periodontal disease and gingivitis, this dog had to have several teeth removed, including all of her upper incisors. many pets. The rate at which this build up occurs depends on many factors, including the breed, jaw structure, type of food eaten, and dental home care by the owner. Thus, some dogs and cats are more prone to this problem than others. Well over half of the pet population is prone to develop tooth and gum disease by the time they are a few years old. The staff at Crookston Pet Clinic is genuinely interested in maximizing the companionship you have with your pet by sensibly avoiding preventable health problems. Here are some simple measures you can follow to keep their teeth in good condition. 1. Visual Inspection: First, check the mouth (some dogs are a little head shy and this may take a little patience on your part). Gently fold back the lips and look at the teeth and gums. Ideally, the teeth should be ivory or light-tan colored and the teeth should be smooth and shiny. The gums should be a nice pink color and free of any areas of localized redness or swelling. 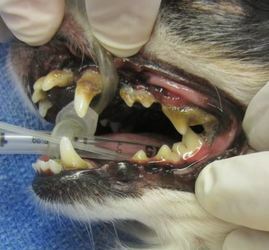 If the dog or cat has tartar or plaque build-up, you will notice it as tan or brownish debris accumulated on the teeth where they meet the gum line. It is most noticeable on the “cheek teeth”, the larger teeth along the sides of the jaw. 2. Foul Odor: Dogs with tartar or plaque build-up commonly have a foul odor to the breath. This is from the effects of the bacteria feeding on the plaque that builds up on the teeth. This infection can spread to the gums, causing irritation (gingivitis). If you suspect any of the conditions noted above, it is best for your pet to have the teeth cleaned and treated. Please call our clinic. We will be happy to answer any questions you have. 3. Time for the toothbrush! Brushing your pet’s teeth? Yes! In many cases it will help. Dogs and cats can benefit when you brush their teeth daily with an approved veterinary dentifrice (tooth cleansing solution). Contact our hospital for recommendations on proper dental care for your pet. These tips are offered as a service to you, our valued client. If you’d like to make an appointment for a cleaning and examination, please call.